What is a Green Japanese Maple? 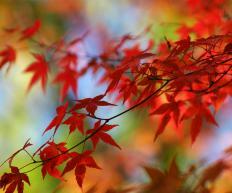 Green Japanese maple leaves turn red and orange in the fall. A green Japanese maple is a Japanese maple cultivar which produces green leaves in the spring and summer, with the leaves turning orange to red and dropping off in the fall. Japanese maples are very diverse trees, and green Japanese maples come in a variety of cultivars which can meet an assortment of gardening needs. Many nurseries carry or can order green Japanese maples for their customers, and people can also visit nurseries which specialize in Japanese maple cultivars to see numerous examples on display. Botanical gardens may also offer opportunities to see many cultivars on display, for gardeners who want to research before buying. Known formally by the name Acer palmatum, Japanese maples have been cultivated for centuries. These deciduous trees produce foliage in a variety of colors and shapes, with some cultivars having a history which dates back hundreds of years. Japanese maples do not necessarily breed true, which makes cultivation of these popular trees very challenging. In the case of a green Japanese maple, the foliage is green, varying from fairly light greens to deep greens. The leaves may be broadly lobed or more lacy in style, depending on the cultivar, and the tree can have an upright, bushy, or trailing growth habit. Several cultivars have also been developed specifically for use in bonsai. Other Japanese maple cultivars produce leaves in shades like yellow, orange, and red, such as the famous Bloodgood Japanese maple. These showy cultivars are often used as garden accents. Green Japanese maples tend to blend in more effectively, making them useful for settings in which a gardener does not want a dramatic, showy tree in the spring and summer. For example, a green Japanese maple can be planted by a flower bed to provide texture and green foliage which will not distract viewers from the flowers. Depending on the cultivar, a green Japanese maple may grow successfully between zones seven and 10, with some cultivars tolerating more extreme climates. These trees famously grow well in the shade, and can in fact be fragile in full sunlight. Gardeners who are not sure about which cultivar will be appropriate can ask for advice from the staff at a nursery, or from an experienced local gardener. Like other trees, a green Japanese maple requires lots of watering and nutrition in the early years of growth to help it get established, but once it has solidly rooted, the need for watering will decline. What is a Coral Bark Japanese Maple? What does a Japanese Garden Designer do? What is a Laceleaf Japanese Maple? What is a Japanese Spirea? What is a Trident Maple? What is a Hinoki Cypress? What is a Japanese Privet? The Japanese maple bonsai are very cute and I think they are the tree most people picture when they think about bonsai trees. They can be trained into many of the classic bonsai shapes, even as full grown trees they are often trained into these shapes to be included in a Japanese garden. There are some varieties that are bred specifically to be bonsai trees, but you can just use a plain Japanese maple if you find one of a nice shape. There are some gorgeous Japanese maple trees in the botanic gardens near where I used to live. They make an idea tree for a garden that you can show all year round. During the spring and summer they are a beautiful shape with long, cloud like groups of leaves. In the fall the leaves are very vibrant and in the winter, the tree still has a nice shape and looks very good in the snow as well. They are planted around a small pond. I think that the leaves falling onto the water in the fall might be a nuisance but aside from that they are a perfect show tree.